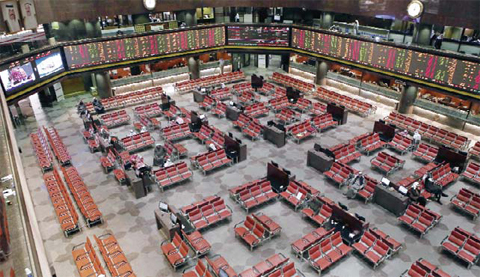 KUWAIT: Kuwait Stock Exchange (KSE) ended yesterday’s session in the mixed zone capping the year 2015 on a bearish note. The price index gained 2.64 points reaching 5,615.12 points, the weighted index lost 0.14 points reaching 381.7 points and the KSX 15 moved down 1.87 points reaching 900.43. The number of trades was 2,108 transactions with a value of KD 8.5 million and a volume of 78.6 million shares. Saudi Arabia’s stock market opened weak yesterday as petrochemical firms remained soft following gas feedstock price rises in Monday’s 2016 state budget. Egypt’s bourse continued rallying after breaking technical resistance. The Saudi index was 0.2 percent lower after 40 minutes of trade as the petrochemical sector index slipped a further 0.5 percent. The biggest stock in the sector, Saudi Basic Industries , was flat but Saudi Kayan lost 2.2 percent and PetroRabigh fell 2.4 percent after saying it would restart only gradually its high-olefin fluid catalytic cracker and subordinate units after an extended maintenance period. It estimated the cost of the extra maintenance at 200 million riyals ($53.3 million). Major construction firm Abdullah Abdul Mohsin Al-Khodari and Sons, which has been struggling with the costs of labour market reform and government spending cuts, rose 0.9 percent after saying it had taken a 135 million riyal interest-free Islamic loan from its major shareholder.